After a strong start to her career, Shailene Woodley has struggled to live up to her promise as a leading lady, with her Divergent film franchise being cancelled due to poor box offi ce. She’s hoping to bounce back with a new film that sees her going back to the drama genre. Loosely based on a true story, the film stars Woodley and Sam Clafl in (Me Before You) as Tami and Richard, two sailors who are thrown into a devastating hurricane during a voyage in the 1980’s. With Richard brutally injured, it’s down to Tami to take care of her companion and fi nd the strength to save both their lives, even when it looks as if all hope is lost. Without the pres- sure of an entire franchise on her back, producer and star Woodley is freer to deliver the type of performance that made her name. She puts the heart into the film, establishing a love story that makes the occasionally dry survival story going. The passion she shows for Clafl in, himself delivering a solid performance, makes you care about her plight, and the determination to survive is etched on her face as she endures months of hardship avoiding numerous threats. The film that surrounds them is not quite as sturdy. An erratic timeline, where we’re thrown back and forth from their current situation to moments in their past, is distracting at times and interferes with the rhythm of the film. The breaks from the trauma are occasionally welcome, but does tend to break the emotional connection at times. That said, the obstacles that the pair meet out at sea are no joke, and underline the sense of peril and isolation (also aided by some terrifi c cinematography). Director Kormákur, who also made 2015’s Everest, again shows the power of the human spirit through well chosen leads and tender moments. He also makes nature into its own fearsome character, creating nightmarish storms and grizzly injuries that are as affecting as they are effective. In the absence of a large cast, their surroundings become an antagonist that they must overcome. 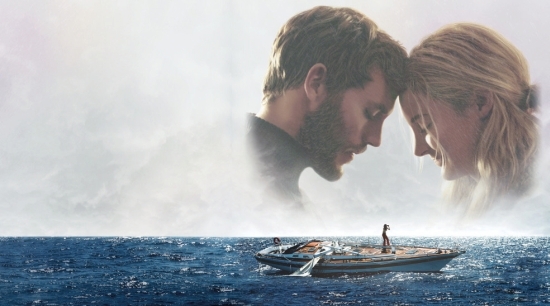 Adrift doesn’t have the momentum to compete with the classics of the survival movie genre, with films like All Is Lost and others tackling the same subject with a greater degree of emotion. However, the power of the lead performance makes it a worthwhile endeavour.